Dr.Hoang is very professional and took the time to show me the three scenarios that could be affecting me. He isvery easy to talk to and I'm glad I found him. Dr.Hoang is very professional and took the time to show me the three scenarios that could be affecting me. He is very easy to talk to and I'm glad I foundhim. 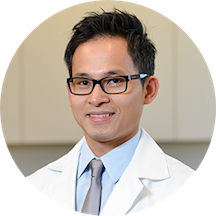 Dr. Hoang joins HMU from the National Cancer Institute – National Institutes of Health in Bethesda, Maryland, where he completed a fellowship in Urologic Oncology. His research focused on the role of MRI and focal therapy in the management of prostate cancer. He has published in various medical journals, authored several book chapters, presented at multiple regional/national meetings, and received many awards for his works. He is also bilingual (fluent in Vietnamese). Dr. Hoang completed his undergraduate degree at Baylor University with a Bachelor's of Science in Biology. From there he went onto medical school at the University of Texas - Houston. Dr. Hoang also completed his internship and residency at the University of Texas - Houston/MD Anderson Cancer Center where he was the Chief resident in Urological Surgery. I would strongly recommend Dr. Hoang, the staff were nice and quick. The doctor explained about my results made sure I understood everything. Very professional. Asked and answered questions. Thoroughly explained what he was doing and why. Completely puts you at ease!! Great physician who seems to care for his patients. Concise, professional and let's you know your options. Dr. Hoang was one of the best doctors I have ever seen. He was thoughtful, caring, and explained everything in a concise and clear manner without dumbing anything down. Though I hope I don't have a need for a urologist againanytime soon, if I do, I'll be sure to visit Dr. Hoang again. Dr. Hoang attended to the issue very well. I had to go and get an ultrasound and when I called back 5 days in a row they would give me the same message that the nurse would call back. The nursenever called back. When I asked the turnaround time the nurse has they said 24 hours. What the nurse was doing is going in the system and entering she tried to call me but got a busy signal for 5 days in a row when I have no missed calls from her. So when you go do not expect much from the supporting staff. Maybe and hopefully it is just that one nurse. Dr. Hoang was awesome. I was some what aprehensive but he made me geel st ease right away. He was very knowledgeable, very thural and yook his time to make sure I understood the treatment and other options. The staff wadvery polite, courteous and profesional. The office was very clean and well kept. I would definitely recommend him snd give him 10 stars?? Doc is very straightforward and explains medical issues/treatments in layman' terms. Dr Hoang was awesome! He was one of the most personable doctors I have seen in a long time. He was a great listener and did not rush the appointment at all. He was very efficient and professional. I highly recommend! Great Guy, explained everything in detail, which many doctors dont. Thank you for great service. Very professional! He cares about the patient. Dr. Hoang was very thorough in his concern for my husband's challenges. I would certainly recommend him and will be going back to him in a few weeks. Dr. Hoang was both personable and very attentive to my medical concerns. He's a qualified and doc who listens to what the patient has to say. Definitely recommend him! Dr. Hoang was very personable. He listened to my concerns. Drew a diagram of the explanation being given. Would highly recommend him to others?? Dr Hoang is a young, very sharp and good doctor. He is very nice to patient, he always ask the patient if they have any question to ask. Dr. Hoang is very professional and the perfect doctor to see if you are Vietnamese. He speaks fluent Vietnamese and is extremely respectful of elders like my father. My father (who is not very good at English) went in for afollow up and it was easy communication. I highly recommend Dr. Hoang if your parent needs a Vietnamese speaker! Dr Hoang did the most important thing: he took the time to listen. My history is somewhat complex so I had written up a timeline of the relevant info, which he skimmed while questioning me. He thoroughly explained my test resultsand why he was recommending the next steps. My visit was the first step in what may be a long process, and I'm relieved to have someone capable and patient on my side. Very good. Professional but not stuffy. No complaints. Much better than your typical doctor. He gave me the pertinent information and drew pictures as well to illustrate what he was saying. Dr. Hoang was very friendly and professional. I was seen quickly and treated with respect and genuine concern. I found the doctor to be quite intuitive and well versed. Not only would I not hesitate to see him again, I have an appointment. first time visit i dont have much of a feed back yet. Dr. Hoang is a very nice very professional Doctor, I would highly recommend him for anyone's needs.